Samsung just announced the rumored Galaxy S II Plus on the hush-hush, and the specs don't differ from the ones it had on its 2011 flagship, but the phone is breathed new life by loading it from the get-go with Android 4.1.2. It also supplied it with its latest Nature UX interface, which features options like Smart Stay that keeps the screen on when you are are looking at it, and PopUp Play, which detaches the current video in a separate hover window, so you can do something else underneath. Other than that, the specs stay a 4.3" WVGA Super AMOLED Plus display, 1.2 GHz dual-core chip, a gig of RAM, 8 GB of storage plus a microSD slot, 21Mbps HSPA+ radio, and an 8 MP rear camera with zero shutter lag this time. Samsung only enabled the NFC radio from the box for certain markets, and called it a day. We can imagine the Galaxy S II Plus will be selling dirt cheap, and it is still a Samsung, so it would fit well in the hearts of Android fans in emerging markets, and not only. Samsung Electronics Co., Ltd. announced today Samsung GALAXY S II Plus, which combines the performance that have made the GALAXY S II one of the world’s most recognized phones, together with nature-inspired user-interface and intuitive features that greatly boost its usability and functionality. This would be a good phone off contract. $300-$400 max or even less. Id buy it. Its powerful enough and its still a great phone. LTE is a big +, that the more powerful LG Nexus doesnt offer ironically. 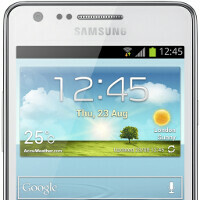 I don't see the purpose of releasing galaxy s2+ when it is exactly identical to the galaxy s2. What changes?? Actually there is a decrease in the storage capacity and is a bit heavy than the original one.. The only change I think is the exterior-color(now available in pebble blue) and hyperglaze..
"Actually there is a decrease in the storage capacity..." SGSII = MicroSD (up to 32GB) SGSII+ = MicroSD (up to 64GB) Does it looks like a decrease??? It has nothing to do with that but in overall you can have more space than in SGSII and it is advantage. What you will better prefer 32GB of internal + 32GB MicroSD on SGSII or 8GB of internal + 64GB MicroSD on SGSII+ ??? Who knows what you are using, I guide on the official data. Read articles on GSMArena or PocketNow and you will know that there is more differences. I don't say that SGSII+ is better than SGSII or vice versa, I just state the fact that there is differences! It comes with a new zero shutter lag camera. Huge improvement there. It's actually a slight downgrade when it comes to on-board storage, but it's good for those who want more power than the GS3 mini but still at an affordable price and with the latest software version. So... Ummm the original Galaxy S2 won't get jelly bean? Because if it does then releasing this phone is pointless. Don't get me wrong. I mean how much money people from 'emerging market' have? I myself just got my original SGS2 6 months ago and now if it doesn't get jelly bean, what am I supposed to do with it? sh*t on it? How bout rooting it and installing a custom rom? Why the hell would I root it and void my warranty. If I am to root it, then why would I buy a new device from the showroom? There were and is plenty of second hand deals. Samsung just doesn't care of their previous flagships just after the new one's are out in the market. But they never understand that this is the device for which the GS3 got i's success. First of all: it is reported that the GS2 will be updated to jb. Second of all: when it comes to phone manufacturers - Samsung provides updates at a far faster rate than any others when it comes to non nexus devices. Third of all: you don't have to void your warranty. You can always unroot the phone should you need to. Fourth of all: Samsung is giving you a CHOICE: either root your existing GS2 now OR wait for the official firmware update OR buy a new GS2 with half the internal storage, but with the latest firmware version. CHOICE = GOOD. That would be all. The One S is a much newer device than the S2. Thus, it received updates significantly faster. Not that it helped HTC that much given their current financial status. Your argument is moot. Again- if you want - you can root your GS2 and enjoy 4.2.1 courtesy of a billion of custom mods. If this phone can go up to android 5.0 then why can't the GS2? no one knows what android 5.0 is.. or if its even coming out in the next few years. I would guess we'd see 4.3 and 4.4 as well as maybe even 4.5 before we see 5.0. Samsung is updating the SGS2's to ICS/JB. Current flagships always get priority. If you dont like waiting then get a nexus. I can't. Nexus devices aren't available in my country.